At the close of the UK market, Unilever was still the biggest loser after reporting slowing sales growth. 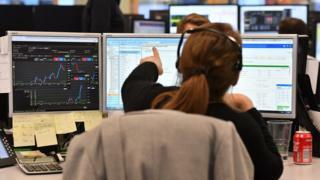 By the end of the day, shares in Unilever were down 5.49%, with the FTSE 100 19.83 points lower at 7,523.04. The consumer goods giant, whose brands include Dove, Marmite and Ben & Jerry's, said underlying sales in the third quarter of the year rose 2.6% to £13.2bn. That was slower than the 3% growth seen in the first half of the year. Unilever cited poorer weather in Europe and hurricanes in the US for the sales slowdown. However, it said emerging markets such as India and China had seen "signs of improvement". In the FTSE 250, shares in IWG plunged 32.22% after the serviced office provider issued a profit warning. The company said third-quarter sales had been weaker than expected, and group operating profit for 2017 was set to be "materially below" market forecasts. Interserve was another firm to be hit by a profit warning. Shares in the construction and support services company sank 30% after it said trading in the third quarter had deteriorated and it warned it could breach its banking agreements. On the currency markets, the pound lost ground after UK retail sales figures came in weaker than expected. Retail sales volumes dropped 0.8% in September, reversing a jump in August, according to the Office for National Statistics. By the end of Thursday, the pound was at $1.31730 against the dollar, falling 0.25%. Against the euro, sterling was down 0.64% at €1.19680.